HPP is the ideal alternative to heat processing for fruit & vegetable products. 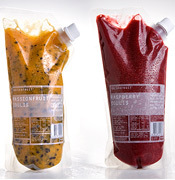 The main advantage is achieving a significant shelf life extension while keeping fresh and home-made taste, because the temperature will stay ambient or chilled during High Pressure Processing. Products maintain higher sensorial, functional and nutritional values while improving food safety. HPP is a good tool to produce high value added products: premium, exportation, RTE, natural and/or organic. Wet salads, purees, coulis, sauces, smoothies, chunks, slices, ready-to-eat products, these are only some examples of a wide range of fruit and vegetable products that can be processed by HPP. 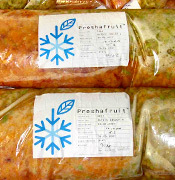 Shelf life is extended while keeping taste and nutritional properties of fresh fruits and vegetables. Shelf life can be multiplied by 2 to 8 times, depending on the product, while sensorial and nutritional properties remain intact. New product development possibilities. Functional molecules that are destroyed by heat, can be preserved using HPP. HPP keeps the antimutagenic components of carrot, cauliflower, kohlrabi, leek, spinach, beet, tomatoes, broccoli and many others. New functional products made of fruit or vegetables with antioxidant properties can be launched. Protects the brand/Safe products. Pathogenic and spoiling microorganisms are eliminated and cross-contamination is not possible due to the post packaging nature of the process. Local products can be exported to the highest quality demanding countries like USA, Japan, etc. Due to high sensorial, nutritional and microbiological quality, along with enhanced shelf life, products will distinguish themselves because of quality. Butz, P.; Fernández-García, A.; Lindauer, R.; Dieterich, S.; Bognár, A. & Tauscher, B. Influence of ultra high pressure processing on fruit and vegetable products. Journal of Food Engineering 2003, 56 (2–3), 233–236.